Britain's most beautiful marathon returns next year, with entries now open for its tenth anniversary. 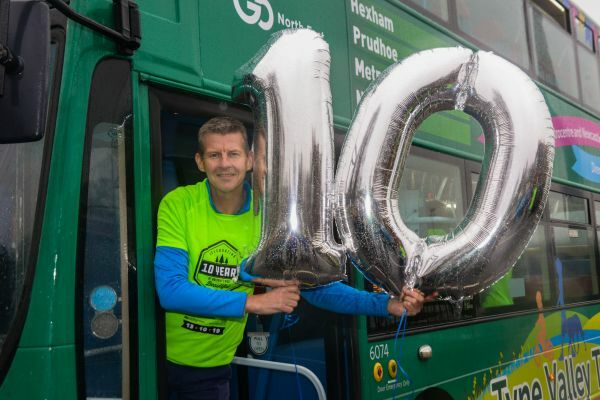 Founder and Olympic athlete, Steve Cram, was on hand to launch the tenth Active Northumberland Kielder Marathon, taking place on 12 and 13 October 2019, together with a group of runners who've taken part in every marathon since it started. Showcasing the nation's favourite holiday county, the 26.2mile course is based around Northumbrian Water's picturesque Kielder Reservoir in Northumberland, and organisers are encouraging runners to get in early to secure a spot. The weekend of events, which saw just three events Iaunched in its first year - the Run Bike Run duathlon, the junior runs and the marathon itself - now includes a 10k race, added in 2011, and, in 2014, a half marathon and a walk were added. From just 975 participants in 2010, there are now more than 3,000 runners from across the UK and even the world, who take part in the events across the weekend, and it draws in a further 5,000 spectators to the region. It's had its fair share of memorable moments over the years too, including its first marriage proposal in 2013, its oldest marathon runner in 2016 at 77-years-old and not forgetting of course, the 2011 runner who shaved six miles off the course and finished in third place by catching the bus. The Active Northumberland Kielder Marathon Weekend is delivered by Events of the North in conjunction with Northumbrian Water, Active Northumberland, Northumberland County Council and Northumbria Healthcare NHS Foundation Trust. Race director and founder, Steve Cram CBE, said: "It's fantastic to be launching our tenth Kielder Marathon with our partners and some of our best supporters, the ‘ever presents', those runners who have been with us since year one. "The last decade has seen the event grow and develop into something we're all very proud of. The Active Northumberland Kielder Marathon showcases the best of a region that's now been recognised as the UK's favourite county destination, and we're delighted that every year we can welcome runners from afar to experience this stunning part of the world. "Reaching a decade of delivering the event is also a time to celebrate and thank all of our volunteers, partners and staff who make it possible year on year to deliver. We're all very much looking forward to our special anniversary and 2019 will undoubtedly be a tenth birthday to remember." Councillor Cath Homer, Cabinet Member for Culture, Arts, Leisure and Tourism, said: "Every year the Kielder Marathon weekend grows in popularity and profile which is fantastic. With Northumberland recently being crowned as the UK's Best Destination in the British Travel Awards, there's never been a better time to visit. "Kielder provides an idyllic setting that gives contestants and their families the perfect spot to explore everything that Northumberland has to offer, often meaning they come back time and time again. I'd encourage those who haven't been before to experience it for themselves, and help make our 10 year celebrations the best yet." Northumbrian Water's David Hall, Head of Leisure Strategy and Transformation, said: "We're very proud to be able to provide the perfect backdrop to celebrate a decade of Britain's most beautiful marathon. "It's put Kielder in the hearts of thousands of athletes, creating thousands of memories and we can't wait to welcome visitors back from far and wide for what will be a very special tenth birthday." For more information on the events taking place at Active Northumberland Kielder Marathon Weekend 2019 and to book an early-bird entry visit www.kieldermarathon.com. Nearly 17,000 runners taking part in the weekend of events. 17 ‘ever present' runners who've taken part in every Kielder Marathon since it started. More than 1,000 volunteers to help marshal the course and ensure a safe weekend. More than 33 countries represented, from as far away as Venezuela and the Philippines. Around 18,000 cakes baked by Falstone and Kielder villages, with valuable funds raised for both villages and their residents. 2010 First year of Britain's Most Beautiful Marathon, including Run Bike Run and Junior Run launched. Marathon won by Kenyan Zak Kihara in 2 hours 29 minutes and 10 seconds. 2011 A marathon runner shaved six miles off the rain-soaked course by catching the spectator's bus and finishing in third place. 2012 Athlete Aly Dixon, who went on to compete for England in the 2014 Commonwealth Games, won the 10k in a record time of 36 minutes and 2 seconds. 2014 Active Northumberland welcomed as new title partners to Kielder Marathon weekend. 2015 Launch of Kielder Half Marathon and Kielder Marathon ‘walk' on the Friday before. 2016 Oldest runner took part in Kielder Marathon at 77-years-old. 2017 The Active Northumberland Kielder Marathon was the venue for the Police Sport UK (PSUK) National Police Marathon Championships. 2018 Olympic legend Daley Thompson attended the full Active Northumberland Kielder Marathon weekend.